The Dymaxion Map is an iconic design that shows accurate information and supports a global perspective. The idea being that if you change the way you see the world, then you can change the world. The Dymaxion Map was created by Buckminster Fuller in the 1940’s to accurately map the earth with no visible distortion to land masses, no political boundaries, and no western bias in its orientation. It was first printed in Life magazine in 1943, where map could be cut out from the printed pages and arranged in numerous ways. 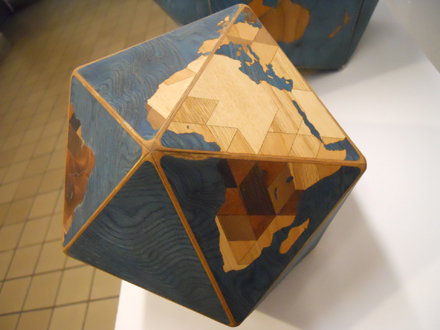 Fuller later settled on a permanent configuration, an icosahedron that broke up none of the land masses and showed the planet as one island in one ocean. 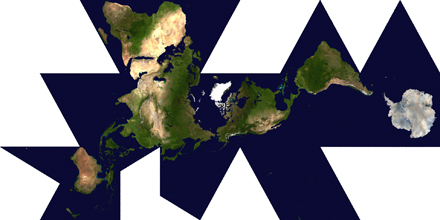 The final map is a series of 20 interconnected triangles, which can be arranged to produce an icosahedron, reminiscent of Fuller’s geodesic dome geometries. To celebrate the 70th anniversary of the Dymaxion Map, the Buckminster Fuller Institute launched a graphic design challenge, to take the Dymaxion into a contemporary context. The contest was called DYMAX REDUX, and was an open call to create a new and inspiring interpretation of Buckminster Fuller’s Dymaxion Map. 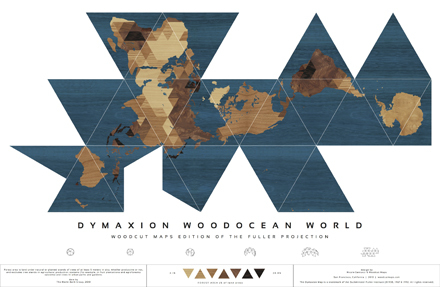 The contest was judged by graphic designer Nicholas Felton, artist Mary Mattingly, and Dymaxion Map cartographer and Bucky’s close friend and associate, Shoji Sadao. The winner of the DYMAX REDUX contest would have the winning design produced as a poster, and along with the other ten finalists will be featured at an exhibition at the Cooper Union for the Advancement of Science and Art, in New York City from October 22nd to November 27th, 2013. They received over 300 submissions from 42 countries. “This was the first contest of its kind organized by BFI, and the response and interest has been amazing. We are thrilled to have such a high-level of submissions and look forward to doing more similar initiatives in the future” says BFI Executive Director Elizabeth Thompson. 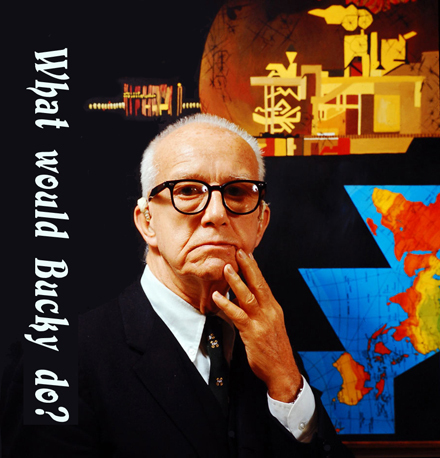 In these changing times, it’s important to always ask… What would Bucky do?